Original participants in our world-famous(TM) Hardware Battlefield, the folks at CubeSensors are back with three new devices that promise to make our lives a bit better. The original CubeSensors were little boxes containing a few environmental sensors. These let you know how much nasty stuff was in your air – particulate matter and the like – and systems of measuring temperature and humidity. 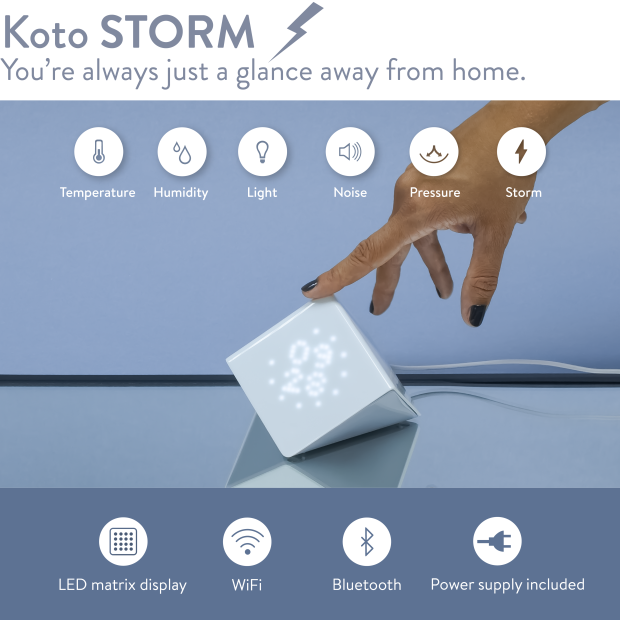 The three new devices, now sold under the name Koto, are called the Blink, the Air, and the Storm. The Blink is a small, basic sensor that tells you whether or not a room is too hot, loud or bright. Think of it as a first line of defense against bad times. The Air includes environmental sensors including systems that control for humidity, temperature and particulate matter. Finally there is the Storm which is a sort of hub for the other two and includes storm sensors. Why do you need all these? The Koto devices are whole-home health monitors. They allow you to check for problems remotely and hide in the background when not in use. For example, an Air sensor could let you know what is happening when your baby lights up a Marlboro in its crib or you light a candle while playing Super Smash Brothers. It can also help pinpoint problems you’re having sleeping, breathing, and simply existing. The company has launched an Indiegogo Campaign and is selling the first set for $369. You can also buy individual pieces separately. They are looking to raise $50,000 and should be hitting that shortly. While the true use case has yet to be discovered for these things – they’re nice to have but not integral in our lives – I suspect as these networks grow we’ll see far more interesting data coming out of them. I, for one, welcome our robotic environmental-sensing overlords.